[News from the News Center] On the afternoon, Mar. 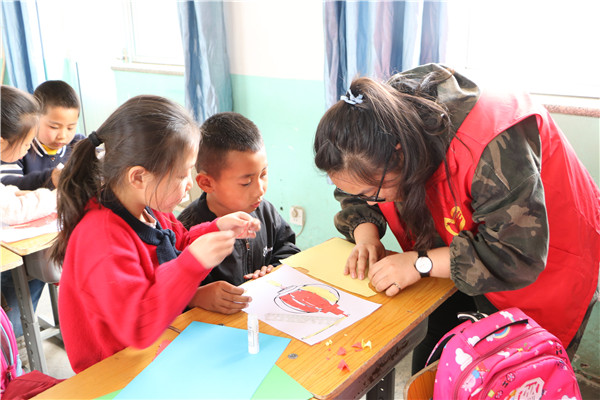 28, the youth volunteers association of School of Electrical Engineering went to Heishanyao Primary School to support education, which is hosted by School of Electrical Engineering Committee of Communist Youth League. More than 30 volunteers participated in the activity. The children are in class. Volunteers and the children play with stickers. At 1:00 pm, the volunteers arrived at Heishanyao Primary School. They were divided into 6 groups and organized different activities around 6 topics. The first group gave presentation of the traditional Chinese culture for the students in Grade One and helped them better understand the Chinese traditional culture in games; the second group introduced the garbage classification for the children and helped them to know that “garbage can also be resources if classified and treated well”; the third group volunteers organized the children in Grade Three to make kite in groups, and taught them the importance of cooperation; the fourth group introduced the customs and characteristics of each ethnic group to the children in Grade Four, which broadened their horizons of customs in each place; the fifth group told stories about mother’s love to the children, reminding them to be grateful constantly. At 3:00 pm, after the activities ended, the volunteers took photos with the children. The support education activity at Heishanyao Primary School is a characteristic activity of the youth volunteers association of School of Electrical Engineering, and they go there every year. This activity has not only enabled children to gain knowledge and happiness, broaden their horizons and stimulate their enthusiasm for learning, but also enhanced the comprehensive quality of the volunteers and deepened their understanding of volunteer service while engaging with children.